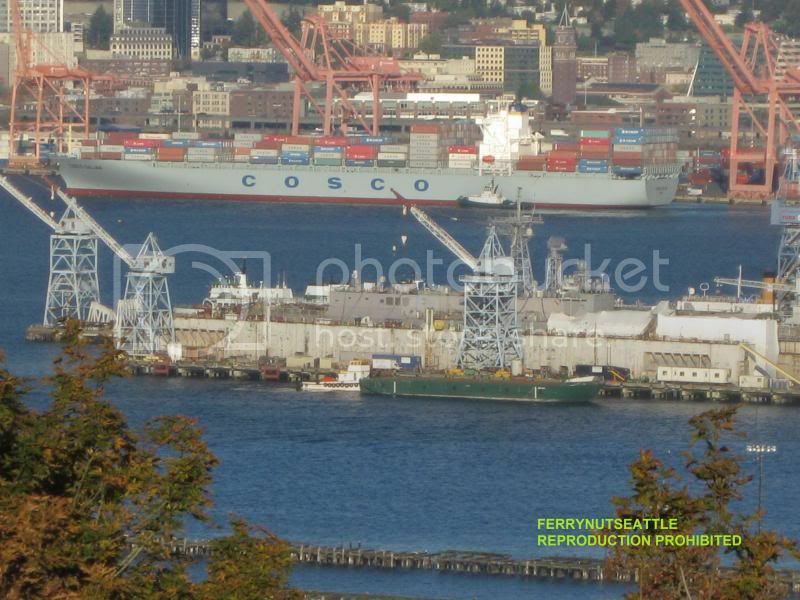 I went to the Admiral Way Viewpoint this early evening to see the new MV SALISH and her upper works in place. 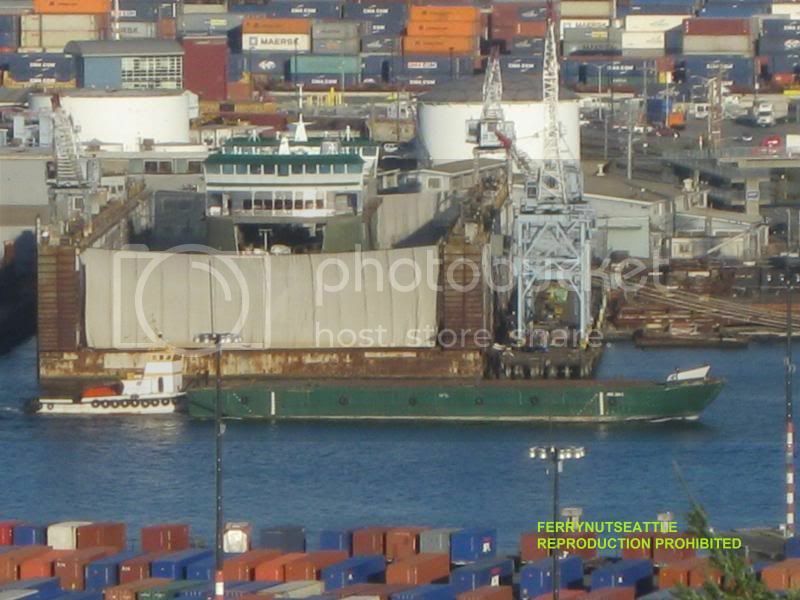 Firstly, we see a push tug moving that green barge that was used to bring down the upper work(s) from Nichols Brothers. Yes, that's the KITTITAS in "sick bay". That COSCO ship in the distance was heading out. 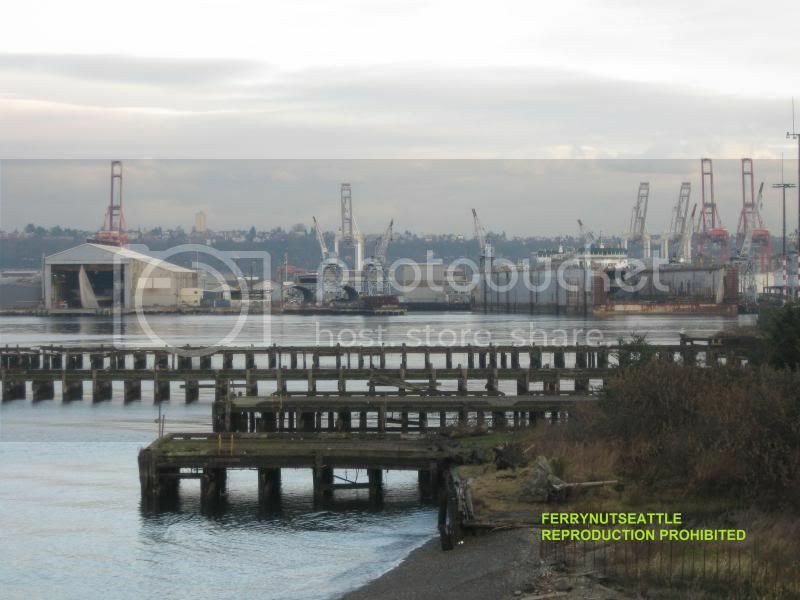 As the tug pushes that barge upstream, we see the SALISH with the upper works installed. The waterfront workers are shielded from sparks from the welding work. Did you really? If true, that is a cool pic. I really did, I was surprised it actually worked! That is one amazing photo, I'll have to try your technique sometime. This provides a neat border on these photos. It's almost like you're in a submarine and using the periscope to look at the surrounding area you are at. I'm very tickled on how this turned out using a digital camera set at automatic exposure. MOHAI has a periscope you can look through. Don't know if this'll be available for use when they move to Lake Union from Montlake. I took a trip over to Jack Block Park today. We see some progress on the new MV SALISH as well as the MV KENNEWICK. MV SALISH on December 2, 2010. MV KENNEWICK in the hole on December 2, 2010. Both ferries on December 2, 2010. Shouldn't be too long from now until we see the SALISH get her first paint job and lowered to her namesake sea. What's the progess on the boat these days? In a PI article they said it was undergoing Sea Trials, maybe a bit premature??? As of two weeks ago I think it was at 68%. Certainly not anywhere near doing sea trials. The M/V Salish – second of three new boats being built for Washington State Ferries – is being christened Tuesday, Jan. 4 at Todd Pacific Shipyards in Seattle. Washington State Senator Mary Margaret Haugen, D-10th District, chair of the Senate Transportation Committee, and officials with Washington State Ferries, Todd Pacific Shipyards and other interested parties are slated to attend the 3:30 p.m. ceremony Jan. 4 at Pier 3 in Seattle. The ceremony news was shared with the media on Jan. 3. Salish is the second in the new Kwa-di Tabil (64-car) class of ferries. The first ferry in the class, the Chetzemoka, began service on the Port Townsend-Coupeville (Keystone) route, on Nov. 15, 2010. Washington State Ferries has said the Salish should be delivered in spring 2011for sea trials leading to service in June. Once planned as the second boat on the Port Townsend-Coupeville run, where the ferry actually serves depends on state budget cuts and legislative decisions being made in the next few months. 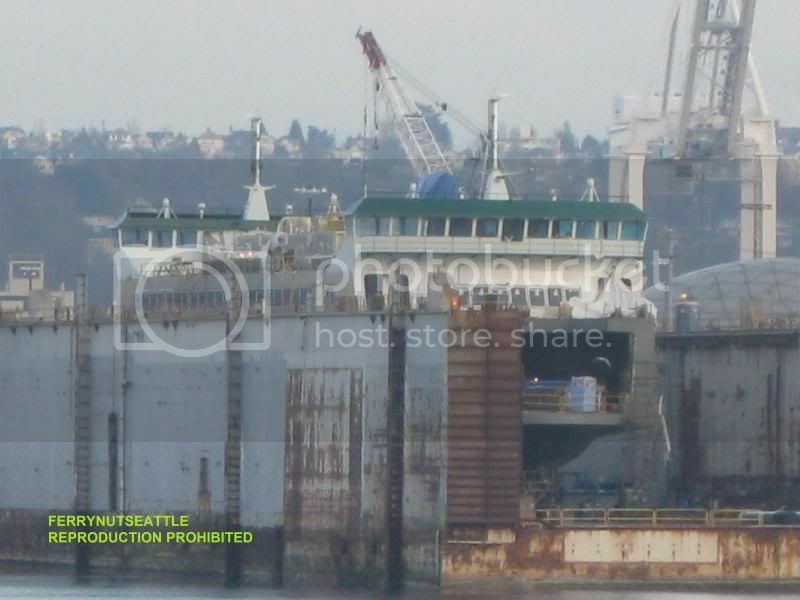 The sister ship M/V Kennewick is expected to be delivered in the winter of 2012. Now that the final chapter has been acted upon with the return of the STEILACOOM II to her rightful owners and the place of her intended service yesterday, we can close the book "The Lease of the STEILACOOM II to WSF" and put it on the shelf for good. We now pull out the book from our shelves on the construction of the new SALISH and open it up again. Let's turn the page to the next chapter of her construction: "Finishing and Testing". Don't rule out the STII or the Christine Anderson coming back to the State's assistance in the future. With the looming budget cuts and the possibility of mothballing of WSF Vessels, one or the other may be called upon to back up the Point Defiance/Tahleguah route on an emergency basis. Afterall, Pierce County will only be using one boat at a time. This was on KOMO News tonight. Looks like Salish is heading towards Everett. She was towed by the tug WESTRAC today. First movement on the ship trackers was at 0830PST and her arrival was shortly after noon PST. 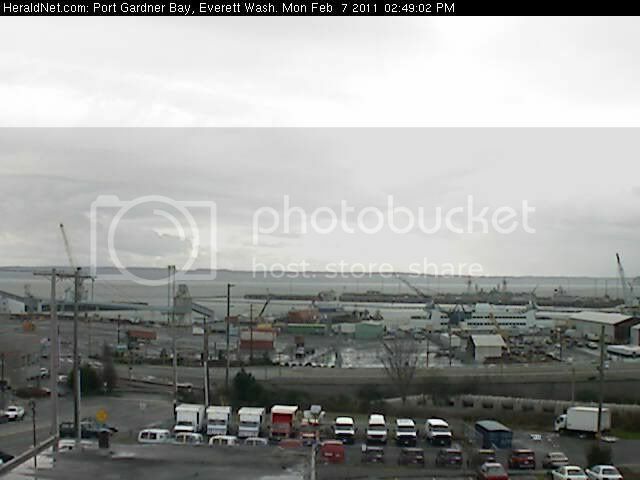 From the Everett Herald's webcam. The cam's clock is a half hour behind. 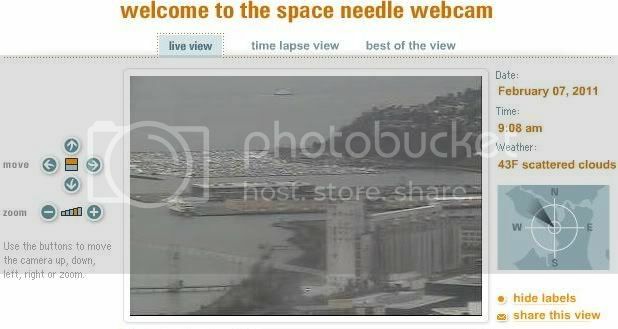 I think we'll call this the "SALISH Cam" for awhile. KIRO TV had its helicopter over the SALISH on Monday. Funny to see the WESTRAC running astern during the trip to Everett from Seattle! 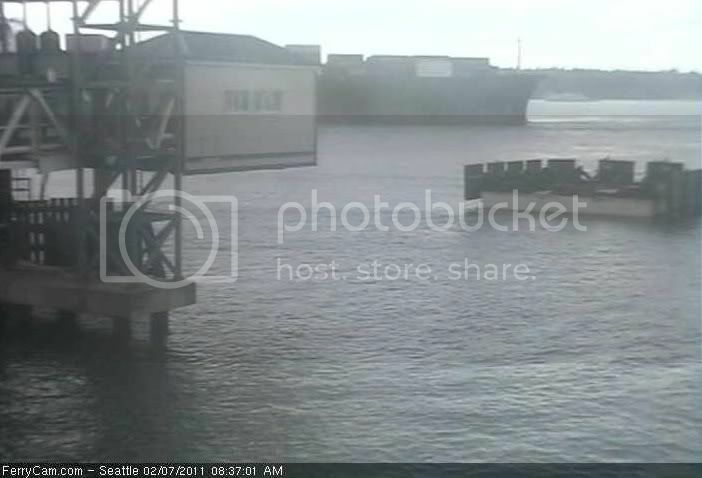 If you remember the CHETZEMOKA's move to Everett from Seattle for her finishing, the WESTRAC pushed her all the way up there with people on the bow of the ferry on watch for marine traffic. The WESTRAC is a Z-Drive tug. Amazing what tugs can do these days. Why did the Westrac pull her backwards? Does it have something to do with the risk of accident decreasing when pulling an object as large and cumbersome as a ferry? They tie the tug's bow tight to one end of the ferry and push. Done that way for maneuverability. 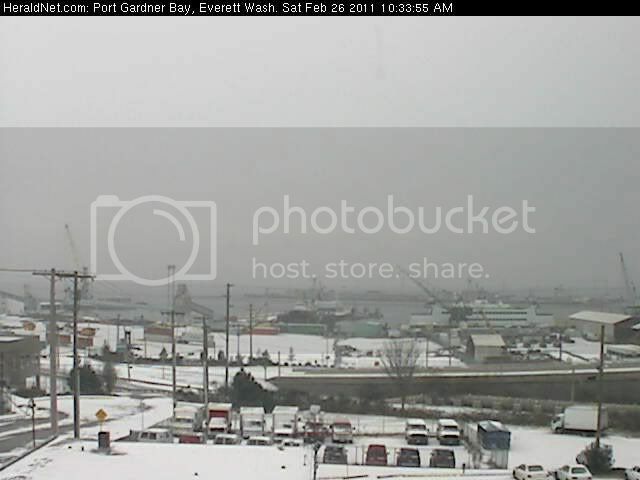 From the Everett Herald webcam, currently known by us as the "SALISH Cam", we see the new MV SALISH in the snow. WSDOT just posted new pix on their Flickr photostream set on the Salish. I have zoomed in on one of the photos and I think they are placing the same color of tiles onto the interior decking of her cabin as what the CHETZEMOKA has. Light green. Would be interesting if they install the same green colored benches and seats as well. 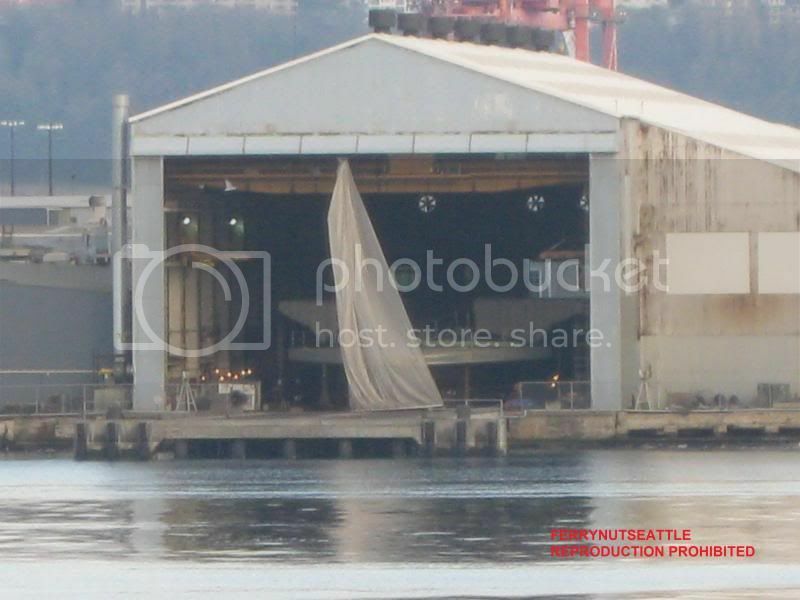 Zoom of photo from WSF of SALISH's interior. What I don't get is why Haugen is acting all surprised. The language for moving the boats around is in the bill SHE WROTE for heaven's sake! With it now almost certain that Central Whidbey will get its second summer ferry, a vessel switch-a-roo may be in the future. According to Sen. Mary Margaret Haugen, D-Camano, Washington State Ferries officials may be considering having the Salish and Kennewick permanently take over service on the Coupeville-to-Port Townsend ferry route once both vessels are completed. The Chetzemoka, the ferry currently in operation on the route, would be sent south to replace the 1947-built Rhododendron on the Point Defiance-to-Tahlequah route, a task that has from the start been intended for the Kennewick. All three vessels belong to the Kwa-di Tabil class and were commissioned to replace the 80-year-old Steel Electrics. They were retired in 2007 for safety reasons. The Chetzemoka went into service this past November, while the Salish is expected to go into service this summer followed by the Kennewick this winter. But the ferry-shuffle may only be a rumor. Haugen said she has received no official word that such a move is intended or even under discussion but learned of it indirectly from ferry officials. The purpose of the prospective move is based on differences in the vessels’ propulsion systems. The Salish and Kennewick have variable-pitch propellers — technology that increases control and stopping power — while the Chetzemoka does not. Keystone Harbor leading to the Coupeville terminal, referred to as “The Hole” by some ferry workers, is commonly considered the most challenging ferry landing in the entire system due to its narrow entrance, strong currents and shallow depth. If the run were to be serviced by vessels with greater maneuverability, it could improve reliability, Haugen said. As it is, even with the brand new Chetzemoka, the route has more cancellations due to tides and currents than any other route. Washington State Ferries spokeswoman Marta Coursey said she hasn’t heard any discussions about any ferry swap and that the plan is still to send the Kennewick to the Point Defiance-to-Tahlequah route once it enters service sometime this winter. Coursey said the information may have come from comments made by ferry operators who have spoken about the challenges associated with the Coupeville route. Haugen said she learned of the plan from her staff, who in turn heard it from ferry officials. While she said again that she knows of no final decisions, she speculated that there may be some hesitancy within the transportation agency to make the change due to political pressures associated with the Chetzemoka. The vessel was the first permanent replacement vessel on the route and was named after the S’Klallam tribal leader Chief Chetzemoka by communities on the Olympic Peninsula. “I think they are concerned because people feel the boat should stay in Port Townsend,” Haugen said. People in Coupeville, who also wanted to name one of the three ferries after a tribal leader but were turned down, may not have the same concerns. Many are just happy to know that two boats will once again be serving the route. “I’m so thrilled about the second boat that I can’t see straight,” said Eileen Hunter, president of the Coupeville Historic Waterfront Association. Ferries officials had been planning to send the Salish to routes in the San Juan Islands as a cost saving measure but its placement on the Coupeville run during the summers is being established by state legislators. According to Hunter, when the Steel Electrics were retired, foot traffic in front of her shop on Front Street declined by about one-third, from 3,000 to 2,000 people a week. Getting back those customers is far more important than the name on the side of boat, she said. “That’s nothing short of a miracle,” Hunter said. I definitely understand the reasons for making the change, but my sentimental side would want for the Chetzemoka to remain at PT/K. So much work and emotion was put into her being the "boat" for that run. Realistically I'd split the difference, and have the Chetzemoka up there during the 2 boat months and Salish playing the "winter" boat, with Chetzemoka being a relief somewhere in the winters. That is until she gets the inevitable CPP retrofit. My other thought is: How long does everyone expect Rhody to remain in service or available as a backup, once all 3 new boats are here? I would expect Rhododendron to be immediately retired once the 3rd Kwa-di "tub toy" is in service. 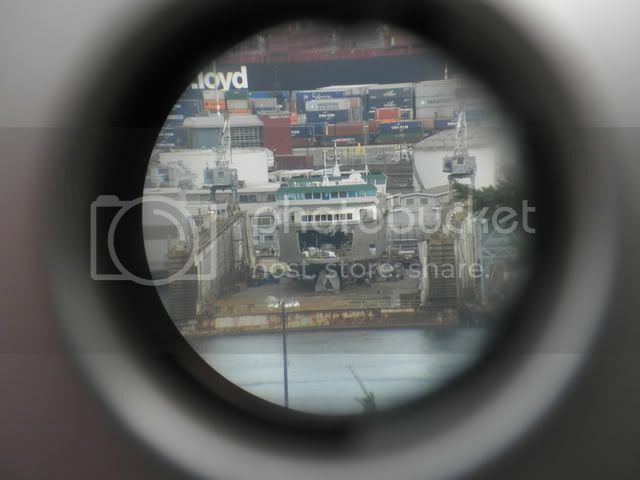 The SALISH is spotted on the ship trackers doing a trial run this morning outside of Everett. This may most likely be her first movements on her own. SEATTLE – Keep a look out for the new state ferry Salish this week as it completes builder's sea trials in Puget Sound. The vessel is expected to begin serving the Port Townsend-Coupeville route this summer, restoring full two-boat service to the route for the first time since 2007. Contractor Todd Pacific Shipyards is conducting sea trials to demonstrate the vessel to U.S. Coast Guard and WSDOT Ferries Division (WSF) inspectors before WSF accepts delivery of the vessel. Later this spring, WSF crews will begin operational training and familiarization with the Salish on the Port Townsend/Coupeville route to get the vessel ready to sail this summer. "We're pleased to be getting this vessel on the water for its initial sea trials on schedule and on budget," said Steve Welch, President. "These sea trials bring the state one step closer to getting a second new ferry into service," said David Moseley, assistant secretary for WSF. "Much like our friends in Port Townsend and Whidbey Island, we look forward to the Salish restoring full service on the route." PORT TOWNSEND — The MV Salish will begin sailing the route between Port Townsend and Whidbey Island in July, the state ferries system said. The announcement caps the victory felt on both sides of Admiralty Inlet when the state Legislature kept the boat in place on the route after Washington State Ferries recommended moving it elsewhere and leaving the Port Townsend-Coupeville route with only one ferry. When the Salish sails, the route will return to two-boat service for the first time since the Steel Electrics were retired just before Thanksgiving in 2007. “We are thrilled to return to a level of service that we haven’t had for four years and are grateful that the Legislature did the right thing to keep it in place,” said Port Townsend Mayor Michelle Sandoval. However, both boats will operate in tandem for only the summer and spring seasons and part of the fall, Port Townsend City Manager David Timmons said. One will be taken off the route in October or November during the winter to be used as backup for other boats in the system needing repair and then returned to the Port Townsend-Coupeville route sometime in the spring. Sea trials for the new boat are scheduled to begin in May, Marta Coursey, state ferries spokeswoman, told Timmons and city Marketing Director Christina Pivarnik during a meeting in Port Townsend on Monday. The vessel is expected to begin sailing the route in July, but the exact date is uncertain, Timmons said. “We would like to see this in service for the July Fourth weekend, but the ferry system can’t commit to an exact date,” he said. The Salish, a 64-vehicle ferry, is the second of three Kwa-di Tabil Class boats contracted by the state at a cost of $213.2 million to be built by Todd Shipyards in Seattle. The first, the MV Chetzemoka, began service on the Port Townsend-Coupeville run in November while the third, the Kennewick — destined for the Point Defiance-to-Tahlequah route once it enters service sometime this winter — is now under construction. The Chetzemoka was slated to go into service in August but was delayed until November because of problems with the fixed-pitch propeller. The new ferry will have a variable-pitch propeller, which will make it easier to maneuver, the state ferries system said. The Salish’s inaugural sail will be less of an event than that for the Chetzemoka, which featured the governor and other dignitaries, but it will still be tied to whatever is happening in Port Townsend at the time, Timmons said. He said the state ferries system will provide two or three weeks’ notice of the date of first sailing. Also discussed Monday was a plan to make discounted display advertising on the boats available to local businesses in order to draw traffic to their stores. The Salish’s presence on the Port Townsend-Keystone route was thrown into doubt in the fall when its relocation to another route was suggested as a cost-cutting measure. At that time, state Sen. Mary Margaret Haugen, D-Camano Island, chairwoman of the Senate Transportation Committee, and state Rep. Judy Clibborn, D-Mercer Island, who chairs the House Transportation Committee, fought to keep the boat on the route. The boat’s presence on the route was included in both the Senate and House transportation budgets released in March. Timmons said Haugen “did a terrific job” in making sure the Salish stayed in place and that this would make a big difference to Port Townsend businesses, which depend on tourism. The Steel Electric ferries, which had provided two-boat service on the route for many years, were suddenly retired when they were determined to be unsafe. 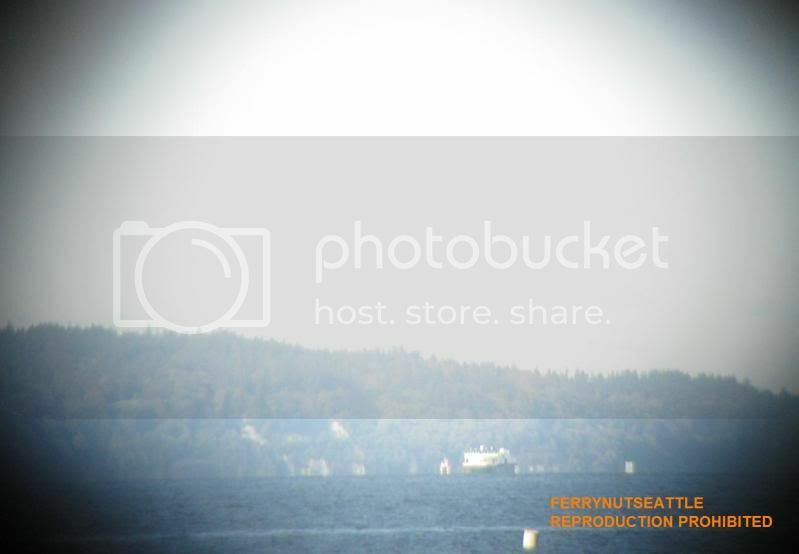 The state ferries system leased the Steilacoom II from Pierce County to operate as the only boat on the route until the Chetzemoka, the first boat built by the state in at least a decade, took it over. In March, Sandoval said the state ferries system had considered discontinuing the route entirely and that city officials felt lucky to get one new boat. Sandoval said that after Port Townsend lobbied tirelessly for the Chetzemoka, efforts on behalf of the Salish were left to Haugen and the Whidbey Island Ferry Board.